We’re currently working on a print version of the Dawn of the Unread serial and then I’ll be going into hibernation as I begin 6 months of research into a possible part II to our literary graphic novel. It’s tentatively titled Untold Stories and will give voice to those who dare not, or cannot, speak for fear of persecution. But more of this another time. For now, here’s a quick update on what some of our writers and artists have been up to. Kate Ashwin, the artist for our Byron Clough issue, achieved the first stretch goal of her kickstarter campaign in record time, waking the next morning to discover she’d reached her pledged goal of £4,000. At the time of writing she’s nearly doubled her original goal. The money will enable her to print the latest issue of her Victorian adventure romp Widdershins: The Green-Eyed Monster. She’s also dyed her hair blue. Nicola Monaghan (aka Valentine) explored the life of Alma Reville in issue 6. In addition to offering aspiring writers advice via trance tracks, she’s found a digital publisher in Blue Morpho Press. 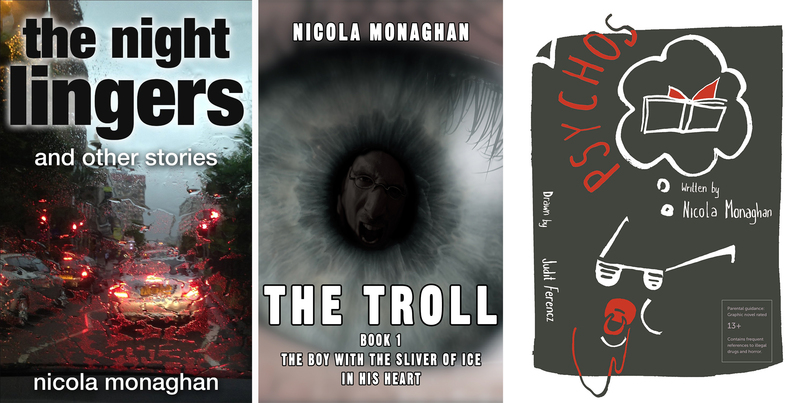 The Troll book 1 is out now and book 2 is due to follow any time soon. You can also read her first collection of short stories ‘The Night Lingers and other stories’ or sit back and enjoy her forthcoming film STARCROSS. Phew, that girl’s been busy. In the exclusive article, Nick expressed his desire to adapt Mick Jackson’s The Underground Man. It’s been a long time coming. It’s had to battle its way through round after round of arts cuts but thanks to persistence, cracking source material, and the support and determination of Nottingham Playhouse, Nick will be bringing this incredible story to the stage on 27 September 2016. It will be a co – production between Nottingham Playhouse and ajtc Theatre Company. After opening in Nottingham it will tour the region before spreading out nationally. Andrew ‘Mulletproof’ Graves was the commissioned writer for Issue 8. Here he explored the life of the eccentric, subterranean Duke of Portland. 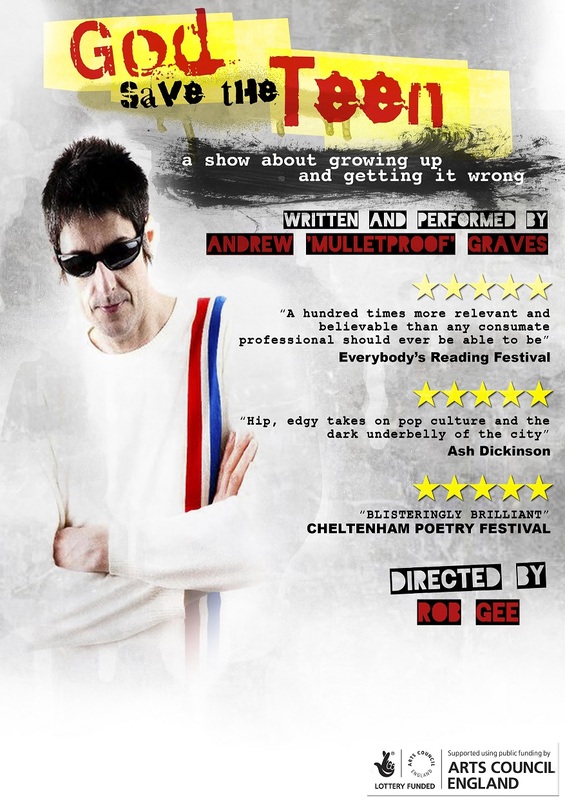 Since then he’s had his second collection of poetry published (Light at the End of the Tenner) and is now preparing for his Arts Council funded spoken word show God Save the Teen which will initially tour the East Midlands. In it he recounts his past life as a council youth worker, offering tales of drugs, relationships, and the various mistakes that invariably become wisdom in later age. Your best bet for catching him locally is at the Nottingham Writers’ Studio on 25th September 7.30pm – £5. As a freelance writer Adrian Reynolds, author of our Gotham Fool issue, has his fingers in many pies. He’s currently waiting to find out if he’s writing a low budget American feature film, which is contingent on fee and contract. Fingers crossed. In October his science fiction short White Lily will finally be viewable, initially by Kickstarter backers, and hopefully at Broadway Cinema’s Mayhem Festival. Elsewhere he’s got another sf short about to shoot in London once some minor script revisions have been approved and his online comic Dadtown now has a publisher, Canadian indie outfit Under Belly Comics. But best of all, as far we’re concerned, his Press When Illuminated talk will be featured at Nottingham Playhouse as part of their upcoming Conspiracy season. Aly Stoneman is the lady in green, to the right of the picture. 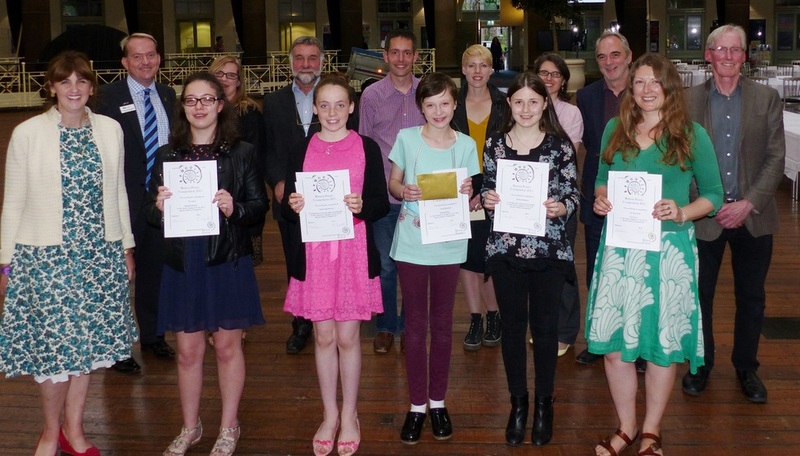 Alyson Stoneman wrote our Ms Hood story for issue 10 and recently won the Buxton Poetry Prize on 7 July. The theme was ‘time’ and the prize was judged by Helen Mort. Aly’s poem ‘Windfalls’ laments the death of her father, a man of his time, through the changing landscape of an apple orchard. that long cold year the Crimson King rotted, crashed down. you lifted me up to see, it was you made me flinch. You watched Exeter burn when you were five. sheep bleating in orchards beyond the churchyard walls. If you walked in now, you wouldn’t know us. Wayne Burrows was our primary researcher and my first point of contact for odd and intriguing facts. I dubbed him Nottingham’s Stephen Fry for the arts years ago having worked with him on other projects. Wayne also helped write the biogs for our literary figures. He’s just seen Black Glass go to press, which is effectively his greatest hits, poetry wise. The experimental collection Exotica Suite was launched at the New Art Exchange in July. The book is accompanied by a CD of the texts set to music by Paul Isherwood (The Soundcarriers). The launch events also included screenings. Crossing and merging art forms was a characteristic of Wayne’s editorial of Staple magazine. You can find plenty of copies of Staple at the Nottingham Writers’ Studio, but be warned; they’re ever so difficult to put down. David Belbin, the author of our Stanley Middleton story in Issue 14, can finally put his feet up and concentrate on writing after successfully chairing Nottingham’s bid to be recognised as a UNESCO City of Literature. I’ve sat on those board meetings and there’s been some sweat. We find out the result on 11 December. I’ve got some good news that I’ve been desperate to share. But it starts with some sad news first. Graham Joyce was originally commissioned to be one of the writers for Dawn of the Unread. There were many reasons for his inclusion, not least the ridiculous amount of times he won the World Fantasy Award, but because of his keynote speech at the 2010 Writing Industries Conference when he talked about writers having to become more adaptable and writing across mediums if they wanted to make a living as a writer. Dawn of the Unread is a combination of videos, social media, and essays all held together through a graphic novel, made available across media platforms. This made him perfect for the project, in addition to being one of my all-time favourite writers. Graham passed away from cancer earlier this year and a packed memorial was held for him on Saturday 22 November in Leicester. There wasn’t a dry eye in the building. But now I’m smiling because I can share my happy story, one which I know would make Graham very proud. A few months ago I was in Leicester for the launch of a poetry collection and a mini graphic novel that was created in collaboration between ourselves, NHS, Bright Sparks and Everybody’s Reading. We took the format of Dawn of the Unread and expanded it to Leicester. During the break I was stood outside and a woman came up and asked me what Dawn of the Unread was all about. I explained how we were bringing dead writers back to life in support of libraries and bookshops and celebrating Nottingham’s literary history. A young lady overheard the conversation and said ‘my father has just passed away and he was a writer from Leicester. I don’t know if you’ve heard of him but his name was Graham Joyce’. I said ‘of course I’ve heard of Graham Joyce!!! !’ and then told her about how he had been one of the commissioned writers. Her name was Ella. The lyrics in the above song by Emilie Simon were edits that didn’t make it into Some Kind of Fairy Tale. We got talking and Ella said she was an artist about to embark on a Foundation Course in Art. At this point my brain started going mad with possibilities. ‘Can I have a look at some of your work?’ I said, and she showed me a book cover she had drawn for one of her dad’s short story collections. It was outstanding. Ella then explained how Graham had submitted the drawing to his publisher but hadn’t said who drew it. They were blown away and accepted it. I then asked Ella if she would like to be an artist for Dawn of the Unread as this would be a fitting legacy to her father and mean that Graham still had a presence in the project. She burst out crying, we had a quick cuddle, and then began devising a plan. 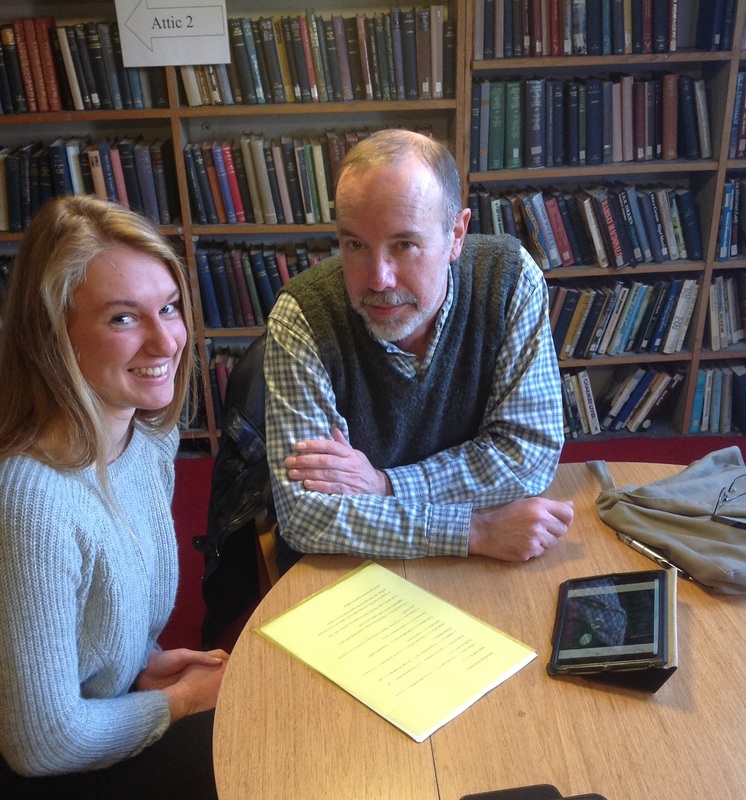 Ella will be working with David Belbin, who used to share an office with Graham at NTU, to help illustrate the life of Stanley Middleton, the only writer from Nottingham to have won the Booker prize. It is a beautiful, symbolic gesture that has absolutely made this project for me, and the kind of layering of meaning that is so essential to us editors. We met up again this Monday and David and I took Ella around Nottingham, showed her some key locations in the script, and discussed how to approach illustrating Stanley’s Middleton’s life given that Ella has never worked on a graphic novel before. I’m not going to give anything away here, but Graham will feature in the story.